Posted April 6, 2017 by Pierre Roustan & filed under Food Philosophy, organic. Think of LYFE Kitchen as a viral trend, but utterly good for you, healthwise. 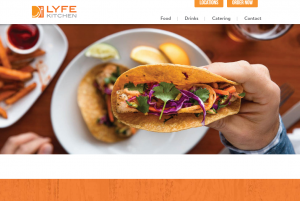 After all, LYFE Kitchen is a restaurant chain with a fast-food mentality, only they serve as much organic as they possibly can while emphasizing sustainability and even vegan sensibilities. Here’s a Question: Do You Know of Any Other Restaurant Out There Other Than the LYFE Kitchen Selling “Vegan Unfried Buffalo Strips”? You won’t find many. That’s just one dish the restaurant boasts. And they don’t play — in other words, they do not mess with any kind of meat whatsoever. Everything they serve is essentially vegan, with a touch of Greek and a lot of local raised fruits and veggies to boot. To make it crazier, this is a restaurant serving breakfast, lunch and dinner if you’re in the mood. But that crunch bowl isn’t for the timid. We’re talking about quinoa tabbouleh, some fresh crunchy veggies and fireman’s hot sauce drizzled over it, and you have a veritable stomach warmer of a dish without a single ounce of fat or meat. The key is the quinoa and other supergrains LYFE can get its hands on, because that’s how you get your protein fix, not by eating a hot dog. And the Best Part? LYFE Is Sweeping the Nation…. Clear from California, to Nevada, then to Colorado and Texas — and then finally Chi-Town in Illinois. So it seems pretty clear: LYFE is trending toward the entire United States, and if the restaurant continues to turn heads, it’ll happen a lot sooner rather than later. It seems that for the first time, fast food will truly go organic in a big way, and the rest of the competitors out there will scramble to try and keep up. Organic food isn’t just trending in today’s culinary market — it’s the trend, particularly with fast food, believe it or not. In all honesty, we really can’t even call it “fast food” given the stigma; nevertheless, this is a restaurant serving food, well, ‘fast’ and with a bit of a moral kick to it beyond that of organic quality. That restaurant is a huge restaurant chain known as Sweetgreen, complete with 27 locations around and in Boston, NY, Philly, and even D.C.. But this is a restaurant that’s so much more than just organic food. Aside from the fact that literally all of their salad ingredients are local, and even their meats are hormone- and antibiotic-free, Sweetgreen prides itself in being a completely “green” restaurant from front to back. Not only are you eating healthy, you’re being healthy just by being in their restaurant! Let’s explain, shall we? For starters, the restaurant utilizes 100% plant-based compostable packaging and reusable salad blaster bowls and bags. How’s that for contributing to the environment. When you think about it, this takes the idea of organic food to a completely new level, because — guess what — you know where all healthy food comes from. That’s right: the Earth. Hence that’s a major double whammy for a restaurant — a fast-food restaurant, no less — to not only serve the best organic dishes ever, but to also ensure the Earth can keep providing all the ingredients we love. Since this is a restaurant chain, you get to wonder how they stay green when building new locations (remember: there are 27 locations and going strong). 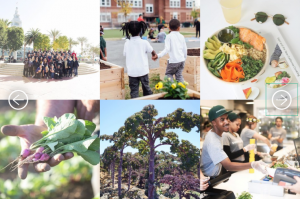 The fact is Sweetgreen upholds Reclaimed and Forest Stewardship Council-certified materials utilized for the construction of new restaurants to house their organic products. Additionally, this is a mantra held even with the design of their restaurants, incorporating low-VOC paint and LED/fluorescent lighting to cut down on energy costs. bins. Walk into the Burger King one more time and see those holes in the counters leading to trash bins filled with paper products and value meal containers, and you know you won’t miss what fast food was initially all about. This is the newest rage of fast food: contributing to the environment. Sweetgreen doesn’t stop there, though, with their efforts to change the world, as the chain offsets all of their energy usage with additional wind energy credits. The darn buildings practically run themselves as if they were off grid (a bit of a hyperbole, but the chain might as well be completely self-sustaining with what they do as a whole!). The Question Is This, Though: Is Any of the Food Good?? If you like plants! Obviously. Make no mistake, the restaurant pretty much is a “salad bar” but with all the fix-ins of a buffet on steroids. Somehow the restaurant takes the idea of eating greens and turns it into a smorgasbord, which is quite the feat already. Even their soups can enrich y ou, what with some spicy and thick, a carrot-ginger able to put a rabbit into a coma, and a chickpea-lentil that’ll love your stomach for hours. One thing’s for sure — you’re going to love kale (unless you already do). It’s their signature green, for obvious reasons, but what the dive does is turn kale into the new American cheeseburger that would make McDonald’s green (no pun intended) with envy. Part of why you’re in an organic smorgasbord of inundation is that the restaurant absolutely loves its dressings, one of them being a pretty wicked agave-dijon vinaigrette. And understand this: you get actual levels of just how much dressing you want on your salad. No drizzles. Only drenches. It helps when even their dressings are practically organic. And what is a “sabzi” salad? You’ll find at Sweetgreen. It’s spicy. And all you need to know is that it’s cornerstone ingredients are kale and spinach (surprise), but with some spicy quinoa, broccoli, carrots, raw beets, basil, sprouts, tofu, carrot-chili vinaigrette and sriracha. Just writing those ingredients down here made my mouth hot. And everyone said that a salad can’t fill you up (unless it’s taco “salad,” obviously). 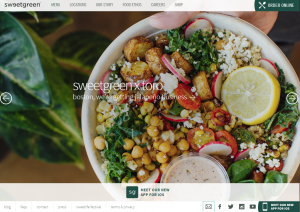 Sweetgreen, of course, does have its comfort food, obviously, particularly with bowls featuring some hearty supergrains. You heard correctly — dishes don’t have to be souped up with kale, lettuce, spinach and other green stuff. You can fill up a tummy with something like their Earth Bowl, complete with quinoa, faro, some roasted chicken, arugula, cheddar cheese, grape tomatoes, spicy broccoli and corn. Like eating something out of a Mexican grill but without the major grease. Nothing fried here. As you can see, Sweetgreen really isn’t a simple “salad bar.” Although a lot of their ingredients typically go in a salad. It’s existential. Sublime. Insane. Even some of their “paper” bowls are made of food (technically, compostable sugarcane pulp). Whatever the case, whatever their “paper” plates, bowls, and utensils are made of, Golden Gate surely approves and enjoys the latest trend sweeping the fast-food nation. Posted March 28, 2017 by Pierre Roustan & filed under fruit, organic, organic produce, organic produce delivery. It’s such an easy solution — you have greens, you make a salad. Simple as that. And don’t get us wrong — salads are great. But sometimes you want something just a bit more substantial, and throwing in pieces of chicken, bacon, hard-boiled eggs, pieces of ham, and maybe even a taco salad just gets a little tired. So what about arugula? What in the heck can you do with that leafy green? Ever Try It With Pizza? — Sounds crazy, right? We mostly think of spinach as a nice go-to for this Italian extravaganza. But arugula? Check this out. How About Meatballs? — You heard correctly. Meatballs, ARUGULA meatballs. Just click here, and we’ll prove it to you. And Soup? — No, we don’t mean a ‘garnish’. That would be a cop-out. Click here to see what it takes to make an actual arugula soup. Talk about insanity. The beautiful thing, though, is all of these ideas rock. And it’s not like they’ve never been tried before. They’re just not at all common. We normally don’t think of these possibilities given the fact those dark leafy greens are just an easy fix with a salad…. Now You Have MORE Ideas for Arugula! Courtesy of Golden Gate. We’re all about invention. Arugula is just one of those inventions you’ll love over and over again. You may or may not want a salad one day. But just in case you don’t — you won’t have to ponder on something new for dinner. Look right here. Your possibilities. Posted March 23, 2017 by Pierre Roustan & filed under organic, organic produce, organic produce delivery. Yes, soup doesn’t have to be made with a broth. Or any type of meat. It can be as simple as this arugula soup made with parmesan cream for that extra body and a bit of cheesy yumminess to go with it. This bit of thought comes from that legendary cookbook author Patricia Wells, a major player with arugula. The idea of soup — and it’s lovely, really, a hearty herbal green soup from one Alain Passard, featured by her. But can this really be that good? Bear with me for a moment. Veggies, meat, some of those hearty potatoes soaked in that broth. Sounds good, right? Soup does not have to be like that, though! It can be creamy. It can warm you up inside. You don’t have to chew. All you have to do is sip to your heart’s content and let it all fill you up with that warmth doing a cold winter’s day. And arugula soup with Parmesan cream? That’s the ticket. You can do that type of creamy soup with just about any other kind of pureed delicacy, but with arugula? The greats about arugula, it proves that even soup can do well with the leafy green if done right. 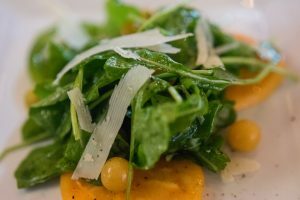 What people tend to like about the Arugula ‘Veloute’ with Parmesan cream is its slightly grainy texture and that sense of fresh herbs in your mouth. It reminds you of the garden. Nature. Beauty. And you’re drinking it all in. When you know you’re pouring down total organic health, you know you’re in good hands. Give it a shot. What do you have to lose? Golden Gate will try if you do. 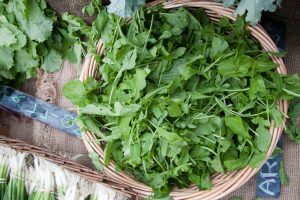 Get some arugula, start working it, get that cream, cook it (or you can even drink it cold during the summer). A ready-made dinner. You can’t go wrong with that. Posted March 19, 2017 by Pierre Roustan & filed under Food Philosophy, organic, organic produce, organic produce delivery. Don’t get us wrong — you’ll need some form of meat for a “meat” ball, but in this case — you don’t need cows. At all. The point is to avoid red meat altogether, and when focusing on the versatility that is arugula, we have a dynamite option for you to try out: an arugula meatball! We need a meat in there. And chicken is the best substitute for that red meat. This does go against the grain a bit given meatballs are quite popular in Italian cuisine. After all, meatballs typically require beef or veal, browned, and then simmered in some simple sauce. You typically throw those meatballs in a salad or, of course, spaghetti, and lo and behold — you have a beautiful Italian dinner. What if you want something a bit ‘slimmer’ and more organic? The point of using chicken is to ‘beef’ up that meatball, so it holds its shape as you cook it. The arugula gives it that dynamite bite you want in a meatball. Just mix it with ground chicken, shape them into balls, toss in a frying pan, and simmer! When they’re brown enough, pull them out, serve them, let your guests stick them, and just watch with joy as they pop those beasts in their mouths. Simple. Forget spaghetti. Forget salads. Just eating them with barbecue sauce at a buffet, and you wouldn’t even know the difference that there’s no red meat in there. How’s that for cleverness. Creativity. Your kids love meatballs? Cook these suckers, and they really wouldn’t even know the difference. That’s just the start of what you can do with arugula, though. There’s a ton you can do with the leafy green. Check it out here and be inspired. After all…. We love invention! Posted March 16, 2017 by Pierre Roustan & filed under organic, organic produce, organic produce delivery, produce report. Full disclaimer here about pizza — it’s the ultimate palate and canvas for you to experiment with anything you could ever possibly want. Just ask those ninja turtles. Just about anything can go well with a pizza pie, but take caution. Some things don’t. You already see the headline here saying something about “arugula pizza,” and it goes way over your head. 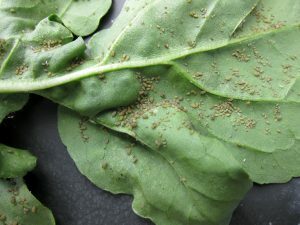 A leafy green other than spinach? Come on! Just remember that arugula’s quite peppery — savory, even. When baked, you’ll need something complementing that taste, and gorgonzola hits the mark quite well. Add some toasted walnuts, and you’ve got a classic combo on a pizza that’ll throw you for a loop. Why gorgonzola? The creaminess, and the more subdued cheesy flavor is just what that arugula needs. If you used regular mozzarella, the pizza would be a bit too strong for its own good. Walnuts sort of replace that same bite you get when you chomp on a pepperoni without the meatiness, which defeats the purpose of the whole combo right away. So you see the connection — gorgonzola, ARUGULA, and walnuts! 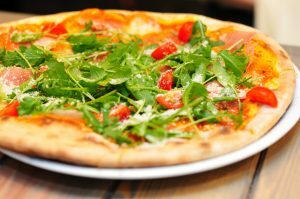 An excellent pizza to try out. Posted March 13, 2017 by Pierre Roustan & filed under fruit, organic, organic produce, organic produce delivery. Ooops…. You just got yourself a produce bag of persimmons when you meant to get some good tomatoes for your tacos. What. Do. You. Do? 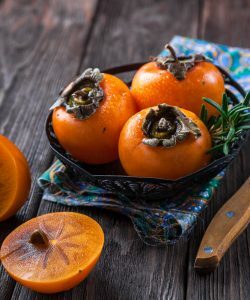 ….Thankfully, you honestly should keep those persimmons for what it’s worth, because lo and behold, you have quite the versatile fruit on your hands! This list of guidelines for what you need to do with your persimmons is the proof. You see, this isn’t your everyday fruit. In fact, you can liken it to a pomegranate or an Ugli fruit, but the main noticeable characteristic of the persimmon is the fact that it looks virtually identical to a tomato. It’s All About the “Shape” — Believe it or not, but the shape does matter, and here’s why. The Variety of Persimmon Is INSANE! — How insane? Let’s just say the all-powerful apple has nothing on the persimmon. Defects and Odd Characteristics — Most fruits tend to look all the same…. Who knew the persimmon would vary a lot? Who knows — after going through this, you just might have your new obsession with organic fruit. But know this: specifically, you’ll want to learn this guideline, because if bitten into when not fully ripe, you’ll want to spit it out! The unripe persimmon may have an astringent taste to it, and that’s largely why it’s so rare. You don’t exactly make a pie with it (although you could, if you know what you’re looking for). Still, Golden Gate approves. And if you time it just right, you might have quite the sweet foray of persimmons to work with. Just remember these prized secrets…. And don’t tell anyone! Posted March 9, 2017 by Pierre Roustan & filed under fruit, organic, organic produce, organic produce delivery. We want to eat fruit that’s sweet, obviously. And it just so happens that if you’re wondering about persimmons, you’re going to want to know that not every variation will be that tasty. Western countries, though, have it a bit easier, but if you just happen to be over in East Asia, know that there are a huge variety of shapes, and it’ll help to have a bit of a guideline about which shapes are ‘good’ (and which shapes are, well, ‘bitter’). For starters, many sweet persimmons tend to have a flat base, very much like a tomato. Typically, indented lines will run from the stem to the base, but not always; some are smooth. What you have to keep in eye on is whether or not your persimmon has a longer, tapering to a blunt point, sort of like a mutant acorn. If that’s how your persimmon looks like, don’t bite into it. They’re even nastier than lemons, which thankfully makes those varieties of persimmon fantastic for all sorts of cooking. Hence Why the Shape Matters, But Doesn’t Make the Persimmon Any Less Desirable! When have you ever come across a fruit capable of so many different possibilities? It’s remarkable. For the more astringment persimmons, you can utilize in salads and dash with other savory items to go along with it. The sweeter kinds can be eaten raw right away. Of course, you won’t know that unless you’ve read this article straight through. So don’t make the mistake of following the guidelines — or else you just might be puckered for a while there. Posted March 6, 2017 by Ross Taylor & filed under organic, Organic Lifestyle, organic produce, Uncategorized. When we blog about various veggies here at Golden Gate Organics, we do our fair share of research to provide accurate information about nutrient content in an effort to increase your attraction to these colorful, dietary wonders. The truth is, if you’re purchasing veggies from local farmers, who use organic or biodynamic farming methods, and who focus on the quality of their soil – you shouldn’t ever need to spend another penny on vitamin or mineral supplements; you’ll get everything your body needs from the seasonal foods you eat. But, here’s the thing: those “nutrient values” are a moving target of sorts. For example, in a recent post about the wonders of collard greens we stated a cooked cup of collards contains 250% of the RDA for Vitamin A. But whose cooked cup is that? Are the collards you get in your weekly veggie box equal to those found in the average grocery store? Or in the neighbor’s backyard garden? 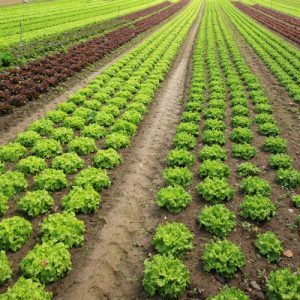 You see, who is growing your veggies – and how they grow those veggies, makes a tremendous difference in the nutritional values of the vegetables you eat. Case in point: The Tale of a Friendly Butternut Squash. A recent post in Mother Earth News (a must-have subscription for those of you who love to garden, grow your own veggies and/or dream of creating a homestead), shares how different soil and growing conditions vastly altered the nutrients of butternut squash. The “tester,” John Frank, works for International Ag Labs. He made a point of gathering 29 different butternut squash from growers around the nation. The growers submitted information about their farming practices – from conventional to backyard organic. While the spread might not seem that extreme at first glance, keep in mind that the squash with the highest nutrient content had three-times higher values than the lowest-scoring squash, and that phosphorous (the second most important mineral when it comes to healthy bones and teeth) was found in seven-times higher concentration in the highest-scoring squash than the lowest-scoring squash. What Mr. Frank learned was that while organic farming is good, biodynamic farming is even better. It’s not surprising that all of the highest scoring butternuts were grown organically, so was the lowest scoring squash. That goes to show that while subtracting herbicides and pesticides is Step One in a health farming culture, concentrating on soil quality is absolutely crucial. The highest scoring squash was grown by Doris and Calvin Bey, owners of Harmony Gardens in Fayetteville, Arkansas. 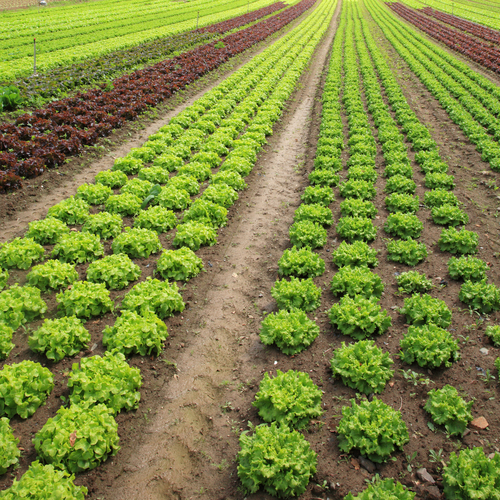 The Beys make it a priority to grow nutrient-rich veggies, and they do so by concentrating on healthy soil. Your farmer’s soil is the food source for your food, so to speak. The nutrients and minerals in the soil are absorbed through plant roots and used to grow vibrant foliage and – hopefully – nutrient-rich vegetables and fruits. Nutrient-rich soil means minerals that are balanced correctly. It also means that the soil is alive with microbes, worms, and mycorrhizae (fungus) – all of which work in the soil to keep it fertile and energized. 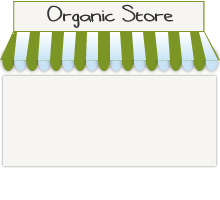 Looking for organic veggies that are grown with an emphasis on nutrient rich products? Sign up for a weekly CSA box from Golden Gate Organics. Your veggies never tasted so good. Posted by Pierre Roustan & filed under fruit, organic, organic produce, produce report. You basically need to follow that dogma to a tee minus a few exceptions. Tricky, yes. But that’s the case for persimmons as you can see here. As far as learning more and more about persimmon varieties, though, the one thing you have to keep in mind is this — not all “varieties” are alike! And we don’t mean necessarily by how they look. Thankfully, here in the West, we have it pretty easy — there are only two varieties — Fuyu and Hachiya. 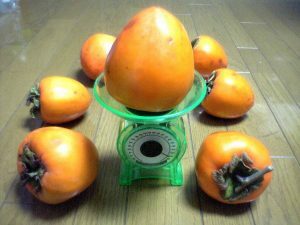 Fuyu is the type of persimmon that’s generally always sweet and can be eaten when firm, very much like an apple. And this is a fruit resembling a tomato! 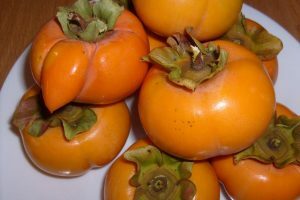 Hachiya persimmons, though, generally are quite ‘tangy’, rough to the taste when firm. You’ve got to wait for those suckers to soften up a bit before you can bite into them. The first six are considered among the sweet kind. So pay attention. The good thing is — astringent or sweet, it doesn’t matter. Persimmons are fantastic for you. If they’re a bit tangy, wait for them to ripen. If you can’t wait, slice them up and throw in a salad. Golden gate approves.